This 30-06 Musgrave rifle had much potential. I chose it for this project because it is mechanically sound. The bore has seen very little use, the action is good and measures square and, internally, the metalwork measures well within all the specifications for bore, groove, chamber dimensions and headspace. Cosmetically it is a disaster. 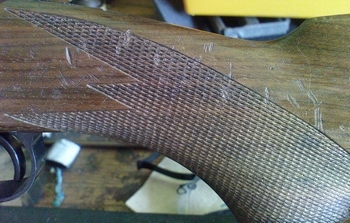 The first step, after stripping the rifle, is to iron the stock to see which dents and gouges will iron out. This has to be done to avoid the dents raising when the finish is being applied. It is disheartening to have a smoothly sanded stock go lumpy again when the first part of the finish goes on and the dents come up. It also reduces the amount of sanding required to cut the wood back to a smooth surface finish. 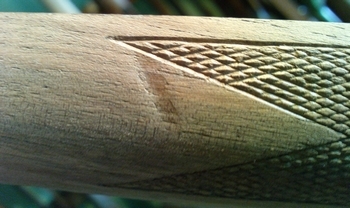 The principle of ironing the dents is that a mark will raise completely if the grain of the wood has not been broken. If the grain is broken, even just on one side of the dent, it will not level out completely. Dampen a clean cloth, lay it over the stock and iron it with a hot iron. The iron must steam the cloth the moment it is applied. 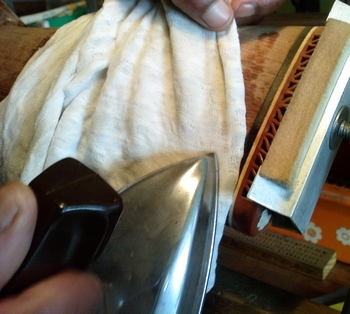 Keep the cloth damp as the wood will scorch if the cloth does not steam when heat is applied. Steaming the stock can be done in sections, or over the entire stock. If a dent is stubborn and does not raise on the first pass, go at it again until it does not raise any further. Dents and gouges in flat areas of the stock can take more sanding down than dents at the edges where the wood meets the metal or where a dent crosses over chequered areas. The stock is sanded with progressively finer paper grits, usually from about a 250 grit to a 1200 grit. If a stock is badly damaged such as this one, starting with an 80 grit saves time. The principle is that all the marks must be sanded out with the first level of sanding paper. After that, the next level serves only to remove the sanding marks left by the previous level. The first level of sanding paper also takes the longest. Never sand by hand, always use a sanding block. This cannot be stressed enough. Sanding by hand always leaves hollows and curves where surfaces should be flat. 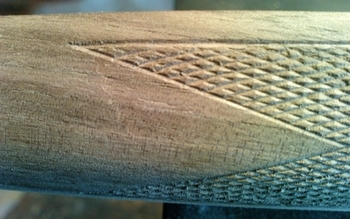 Conversely, curves cannot be sanded well if knobby finger joints are used to back the paper. If the recoil pad will not be replaced, it is sanded with the stock. Preserve the lines of the stock unless it is deliberately decided to change the appearance. Curves should be smooth and defining lines free of waviness and abrupt changes in direction. Sanding a stock, cleaning a rifle or fitting a scope is made a lot easier if a cradle is used. Making a cradle does not take much time and will save the time spent, many times over. After the stock has been steamed, it is sanded with a coarse sandpaper. On stocks that are not as rough as this one, starting with a finer grit paper saves some work. Always lay the block flat on the surface and do not roll it over the edges. This will round off the edges and it looks terrible. If a line is deliberately altered, the block can be used to do that but in general sanding, prevent the block from tilting over edges. Always use blocks to sand a stock, never sand by hand. 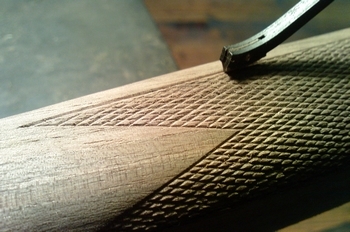 Hand sanded stocks will always have ripples and will have an uneven appearance when the finish goes on. Blocks are easy to make and last forever. Glue a section of hard foam rubber to a block and shape it to conform to the curves or the size of the section that needs sanding. These blocks, with a 7x57 cartridge for scale, are the ones I use most: The big one for flat areas where straightness is important, the small one for getting up close to chequered areas or sharp corners and the curved one for going around the comb and other hollow areas. 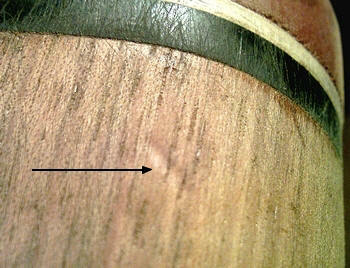 Take extreme care not to sand the stock below the level of the metalwork. Protruding metalwork is a sure sign of amateur refinishing and will remain a part of the rifle until it is restocked. On some rifles the magazine floorplate is proud of the stock but the magazine box should never be visible as in this illustration. After the first sanding with the coarse grit paper, brush the stock with a clean brush to remove the sanding dust. Use a pencil to mark the scratches that remain. Check the stock again for dents that can still be steamed and go at them again. This dent was still visible and raised completely with another two steamings. Here the dent has been removed completely. If the recoil pad is not going to be replaced, sand it together with the stock. This ensures that the stock lines are carried over to the recoil pad. 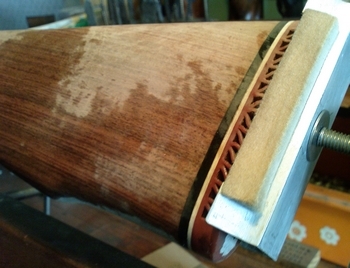 When the stock has been sanded at the first level and there are no more visible marks, set it aside for a day or so before going to the next finer sand paper. This allows any oil in the stock to come to the surface and highlight a lot of marks that you thought you took care of. 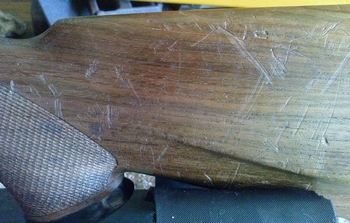 At this point, after the first level of sanding, the grip cap, fore end or recoil pad must be fitted - if those items are to be replaced or added. The chequered panels on the stock are always difficult to preserve when refinishing the wood.With this in mind, you must decide what you are going to do about the chequering on the rifle. 1. 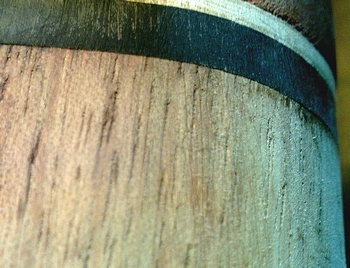 Remove the chequering completely and restore the stock to a smooth finish. 2. Remove the panels and have the stock professionally chequered with panels of your choice. 3. Save the panels and touch them up yourself or have them touched up by a stockmaker. For the immediate purpose of the article, I decided to save the original panels and to touch up as required. 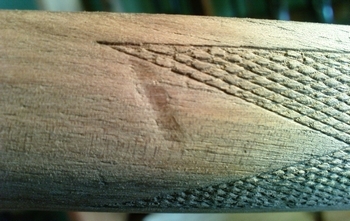 The large dent across the point of the chequered panel has broken the grain on both sides of the dent. This is a more difficult one to deal with and will take several steps. After the first sanding, this is what remained of the dent. It raised somewhat with steaming but it will not raise any further because of the broken grain. Sanding it out completely will remove the point of the chequered pattern as the dent is deeper than the chequering. The solution is to cut the chequering on that part of the panel deeper and then sand the stock again. Here the chequering is deepened, ready for further sanding. 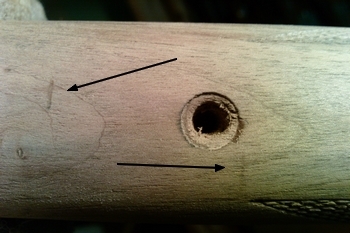 When sanding a specific mark like this, resist the temptation to go at the mark only. It results in a hollow area that is easily seen once the stock is finally smoothed and the finish is applied. Sand the area with a large block, preserving the curves and straight sections. Keep recutting the chequering and sanding until the stock is level and you are ready to move on to the next finer level of sand paper grit.